McStay pinpointed the league win over Cavan as a key turning point in Roscommon’s season. 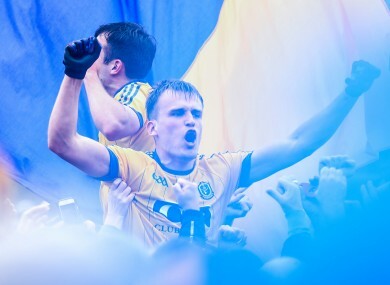 ROSCOMMON MANAGER KEVIN Kevin McStay said his players knew they were capable of delivering the sort of display which would net them the Connacht title. And he said that if their 2-15 to 0-12 Connacht final was being treated as big shock around the country, the win came as no surprise to the Roscommon players and management. “There is a lot of fellas in our dressing room that saw it coming,” remarked McStay. “I am really happy but I am not going to make more of it than it is. I would think Galway were possibly looking at other stuff. We will see them again, they will come again. It will hurt them but Galway are going in the right direction. “To beat Galway was a great thing for the county. We don’t beat Galway and Mayo too often. To be rated you have to be beating the Galways, the Mayos for us. This gives us a lot of confidence. If you want to be want to be rated in the country you have to beat Dublin or Mayo or Kerry. That’s the way it is. It was seven years since Roscommon last tasted success in the provincial decider but now they move directly into the All-Ireland quarter-finals in Croke Park. After a disastrous league campaign which saw Roscommon relegated to the second tier, McStay says the final day victory over Cavan was a turning point. “It was a big one. It turned a corner for us. It showed that we had a bit of pride, a bit of heart. The easiest thing was to lose by seven points in that league match,” said McStay. “The lads that went out really had a cut in a Division 1 game of no significance for most of the country but of huge significance to us. “It was a turning point and Liam McHale said it in the dressing room before we went out today, it showed that we have a bit of guts and belief in the primrose and blue,” added McStay. Email “'There is a lot of fellas in our dressing room that saw it coming' - Kevin McStay”. Feedback on “'There is a lot of fellas in our dressing room that saw it coming' - Kevin McStay”.